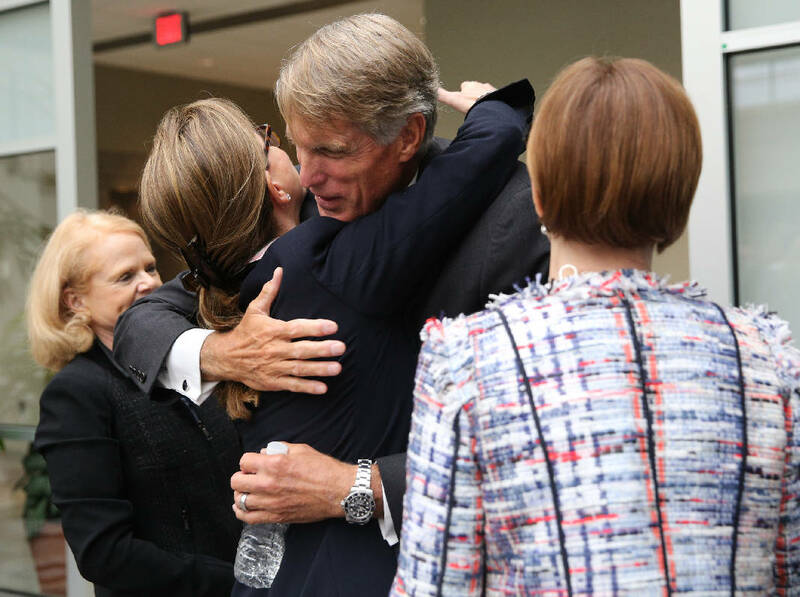 Pamela Godwin, Cynthia Egan and Gloria Larson, all on Unum's board of directors, hug Tom Watjen after the Unum Group Annual Shareholder Meeting at the Unum headquarters building in Chattanooga, Tenn., on Thursday, May 25, 2017. The longtime former Unum CEO and board member Tom Watjen retired during the meeting. 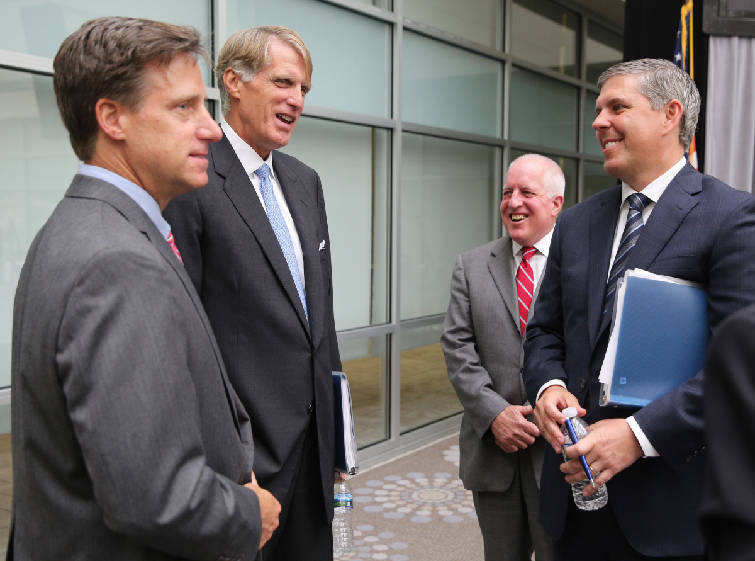 Tom Watjen, second from left, speaks with Jim Sabourin, senior vice president of corporate communication, Jack McGarry, executive vice president and chief financial officer, and Rick McKenney, president and chief executive officer, after the Unum Group Annual Shareholder Meeting at the Unum headquarters building in Chattanooga, Tenn., on Thursday, May 25, 2017. The longtime former Unum CEO and board member Tom Watjen retired during the meeting. Tom Watjen on Thursday recalled his early days as Unum CEO in 2003 when the insurer faced capital, regulatory and rating agency challenges amid charges it wasn't paying valid claims. "Obviously, it had lost the faith of the shareholders," he said, citing a then-dramatic fall in Unum's stock price. "There were a whole clump of issues there we had to stabilize." However, out of that thorny time for the Chattanooga-based company, Unum "kind of reinvented ourselves," said Watjen in an interview after taking part in his last annual meeting as he exits the insurer following 23 years. Watjen, 62, served as CEO for 12 years and then two more as non-executive chairman for the $11 billion-a-year business. Rick McKenney, who became chief executive in 2015, said Thursday that Unum is "much stronger because of [Watjen's] vision. From my perspective, coming into the job, I had big shoes to fill." Last year, the 169-year-old company with about 2,500 employees in Chattanooga posted record-high profit of $931.4 million. Earnings per share were up 8 percent in 2016, the highest in a number of years, according to Unum. "We're halfway into another good year," McKenney told employees and others at the meeting at the insurer's downtown headquarters. In 2003, Watjen was second in command when then-CEO J. Harold Chandler was ousted at the company, then known as UnumProvident after a 1999 mega-merger between Chattanooga-based Provident and Unum of Portland, Maine. Watjen was elevated to the top spot 14 years ago on an interim basis and was later named to the post permanently. Watjen, who received a standing ovation Thursday, said in the interview that the early part of his CEO tenure was spent on stabilizing the situation at the company. "Before you spend a lot of time talking about the future and where you want to take it in five or 10 years, you have to stabilize things," he said. "That was certainly an important phase we went through." At the same time, Watjen said, there was a reason the company had problems. "How do we reinvent ourselves? How do we adjust our business? How do we adjust our strategic direction? How are we thinking about our operations and the people running the business?" he said were questions asked at the time. Watjen said the aim was to work around the company's core competencies and the things it's good at doing, but not duplicating the same problems a decade later. Unum pulled out of Japan and it eventually phased out its long-term care group insurance sales. Last year, meanwhile, Unum bought a Louisiana-based dental and vision benefits business for $127 million. Unum Group announced Thursday that its board of directors has authorized the repurchase of up to $750 million of the insurer's outstanding common stock through Nov. 25, 2018. Also, the board increased by 15 percent the quarterly dividend to 23 cents per common share. The last piece, Watjen recalled, was making sure the steps which were taken were sustainable. "Let's not have a good quarter or good half year," he said. "Today, the momentum continues. Not that we're complacent, but have a sustainable plan where employees at all levels feel engaged in the business." Today, according to Unum, it's the No. 1 company in the U.S. in the disability insurance business, No. 3 in voluntary benefits and No. 5 in group life insurance. The Virginia Military Institute graduate said that while he's leaving Unum, he's serving on SunTrust Bank's corporate board and will soon join that of another financial services company which will be announced later. Also, he said, he plans to do some teaching on leadership and management, with the aim of having a three- or four-day work week. The former CEO said he will leave Chattanooga, dividing his time between homes in Florida and North Carolina. "I love Chattanooga, but in this phase of my life and under these circumstances, I'll get out of peoples' way," he said. Watjen said he had mixed feelings on Thursday. "It's both a really great feeling to complete the [leadership] transition, the details which were planned to happen," he said. "And then all of a sudden you're out of it. This had been my whole life. It's a whole different feeling, but it's all good."